I finally finish up my work for the night, and I’m ready for bed. I crawl under the sheets for a blissful night of sleep. I turn off the light, I lay my head on the pillow, and I finally close my eyes for the day. And then, bam: Did I lock the front door? What if I forget to answer that email tomorrow morning? Did I remember to pack Ryan’s lunch? When will I have time to grade those papers? What did she mean by “that’s fine?” Why can’t I sleep? What if I can’t focus tomorrow due to exhaustion? Gah! And you know what? Sometimes the day isn’t much better. Needless to say, I battle with anxiety. And it’s hard. Can you relate? 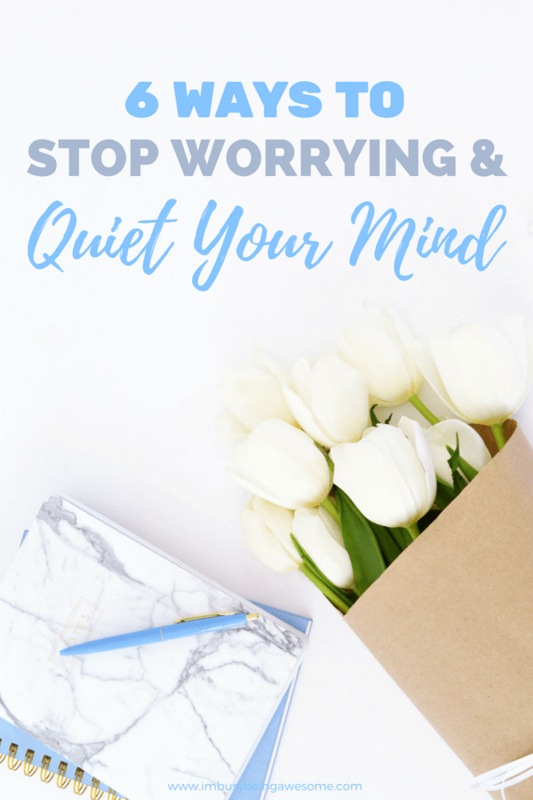 Does your mind ever spin with worry? Do you find yourself fretting over what you can’t control? If so, keep reading. You’re not alone. While I still battle with anxiety, especially at night, it is improving. Over the last year or so, I’ve discovered several strategies that help me recognize and quell that worry before it robs me of another night’s sleep. 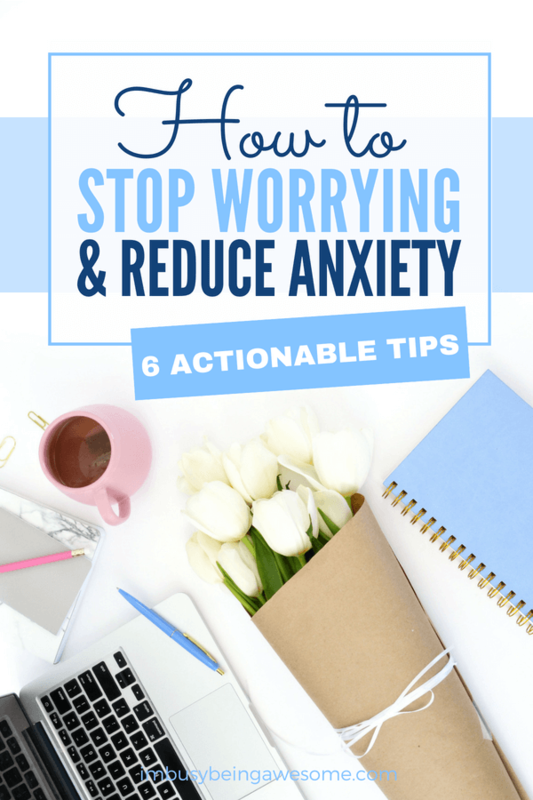 If you’re ready to do the same, then give these strategies a try; learn how to stop worrying in its tracks. For me, worry and anxiety often stem from feeling unprepared. For a simple daily example, I often find myself worrying that I’ll be late in the morning, or I’ll forget something important at home. To help silence this concern, I take a few minutes each night to get myself organized. I place everything I need for the following day next to the front door, and I put my car keys on top of any smaller “do-not-forget” items. If I’m feeling especially anxious, I make a checklist of everything I must do before heading out the door. Taking these few extra steps provides the extra reassurance I need to silence my racing mind quickly. A lot of stress revolves around a perceived shortage of time. I don’t know about you, but when I’m racing the clock, my anxiety levels skyrocket. And needless to say, that’s no fun. But here’s the deal. More often than not, we do have enough time to complete the task at hand. The problem is this: we’re too distracted to focus on what’s important. We get lost in our social media feeds. We’re distracted by our inbox. And we believe the lie that multitasking helps us accomplish things quicker. So cut off anxiety at its source; rid yourself of unnecessary distractions and focus on what’s important. When my mind is racing, I often turn to my trusty bullet journal and do a brain dump. What’s a brain dump, you ask? Simply put, I take 5 minutes to write down everything and anything that’s swirling around in my mind. I don’t hold back or edit for clarity; I just get it all down on paper. Admittedly, your list will look a bit jumbled when you’re done, and that’s okay! It’s much better to have the jumble down on paper than stuck in your head. My list for Thursday included such random thing as: get bananas from the grocery store, submit abstract to conference, call mom, schedule Bruno’s vet appointment, review lecture notes, ask Ryan when the fence people are coming, and put away laundry. Once I have my brain dump in front of me, I highlight the items that need to get done, and I write them on my to-do list for the following day. Knowing that I will tend to those pressing projects the next day – and that I won’t forget since they’re written down – helps quiet my mind. Related: Wondering How To Complete Your To-Do List? If I’m giving a lecture at an unfamiliar location, speaking at a conference, or even teaching in a new classroom, that familiar feeling of anxiety starts building in my chest. What if I can’t find the conference room? What if the technology doesn’t work? How long will it take for me to get there? By taking some time to visit the unknown location or ask questions about the venue, however, I can help quiet those fears. For example, in April I gave a lecture at a theater in Minneapolis. I had no idea where it was, so I drove there the day before. I learned where to park, checked out the space, and knew how long it would take me to get there. On the day of the talk, things were much less stressful because I planned ahead a bit. I’ve always been a fan of journaling. Ever since I was little, I would take time before bed to reflect on my day. It was a great outlet, and it provided an excellent way for me to unwind. Once I started dealing with anxiety in college and graduate school, however, journaling took on an entirely new role. I found that recording my worries, no matter how big or small, was incredibly therapeutic. Sometimes writing my thoughts on paper helped me realize how unlikely they were to happen. Other times writing them down helped me process my fear and understand its root cause. And occasionally, working through my anxiety with a pen and paper allowed me to come up with a solution to handle the problem. Not surprisingly, all three of these outcomes made sleeping much easier. I learned this last tip from Gretchen Rubin’s Podcast, Happier. Unfortunately, there are times when we simply can’t quiet the anxiety no matter how hard we try. 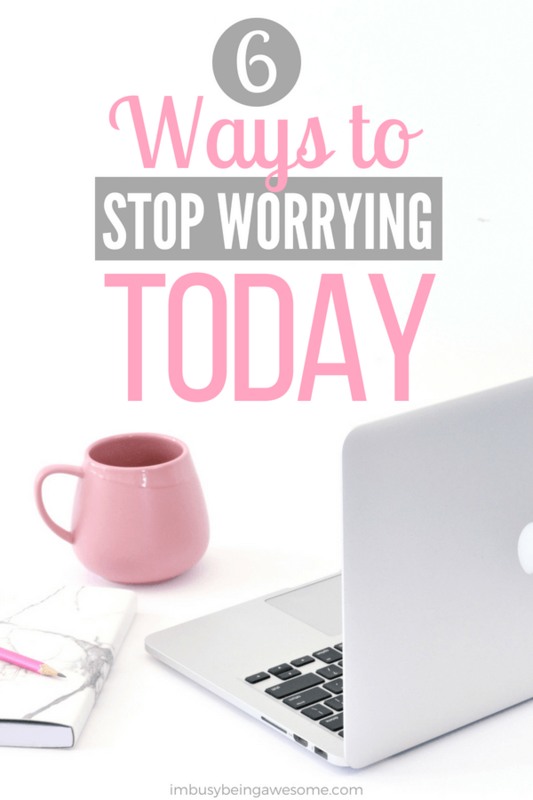 When this happens, Gretchen recommends setting aside a specific time to worry each day. The key takeaway, however, is that you can only worry during that time. If I’m concerned about a lecture I’m giving in a few weeks, for example, I cannot sit around and worry about it all day. Not only will it make the situation worse, but it’s also an incredible waste of time and energy. It sounds a little silly, I know. But give it a try. It’s surprisingly effective. And there you have it, friends. 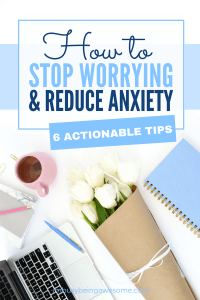 Those are my top six strategies to stop worrying and silence unnecessary stress and anxiety. Want to keep these reminders nearby? Download a cheat sheet with my six strategies here! Do you struggle with anxiety? What are your tips to stop worrying? Do you like to journal? Let me know below! Ridding yourself of distractions is great, I do that often and find myself being more productive. I’m a worrier for sure! I agree, making lists and writting out a schedule of to-dos, definitely helps me feel less anxious. They make a big difference, don’t they? Such good information! Thank you for sharing. I have always been a worrier, but am making it a huge focus to reverse this bad habit. It only makes my anxiety worse! So true that we allow ourselves to think little things are important and distract from our real goals. I also love the idea of a dedicated worry time! Such a helpful post. Anxiety can be such a struggle. Love the brain dump idea. Thanks for sharing. I’m so glad to hear it, Annette. You’re welcome! I get anxious if I’ve been working too hard, so I can really use these tips. I love the brain dump idea! It also helps me to talk with my husband. I love that quotation. Thank you so much for sharing it! I love the “worry time!” This is so simple and it sounds like it really would work. Thanks for all your tips! These are incredible tips. I never considered myself as a person with anxiety but I often wonder if I actually have it because I do have those moments of overwhelm. I’m definitely going to bookmark this post! Thanks for the tips! Preparedness and organizing your thoughts are definitely key! I love the idea of a brain dump. I’m going to start doing this before I go to sleep. This would give me less stress because I know I have written down what needs to be done. Fantastic! I am so glad to hear it 🙂 It’s been super helpful for me! I have learned to quiet the mind, and try to leave work in the office and not at home. Hard to do since I do work at home. Yes! Finding that divide when working at home is definitely a challenge. I’m so glad to hear you’ve been able to do it! I got those nervous stomach aches, too, Melanie. I hope these tips help! Anxiety has always been my problem. I hate it also when I overthink, and worry about every thing. People always tell me to relax and take a break. But I feel like I always have a train to catch so I should hurry. Talking to friends helps me deal with my anxiety. I sometimes sit and breathe just to keep calm. I have terrible anxiety and have read more than once to journal. I will have to really consider this. Thank you! I suffer from the same sort of anxiety and I’ve found keeping lists on my phone to be the thing that works best for me. And I put everything in my Google calendar! I love the idea of reducing distractions. I do feel like I have too much going on all the time, and it makes sense to start there and simplify things. It’s amazing how much simplifying can help. Let me know if you give it a try! I am a worrier for sure! I love the idea of making lists and journaling, I will have to try that! I have terrible anxiety sometimes, I find that planning ahead like you suggested helps a ton! Yes! It’s amazing how much that extra step helps, isn’t it? These are such great tips! I have a hard time shutting my mind off at night and will definitely be trying these! Ugh! I get like this too. I now get outfits ready the night before and brain dumps too. Every little bit helps. Anxiety is a problem for me, too. I’ve found that not working at night is a huge help for me. I used to write and work after my kids went to bed, but then my brain would get going on work, and I wouldn’t be able to quiet my mind once I got into bed. Now I have a no-work-at-night rule, and it helps so much.